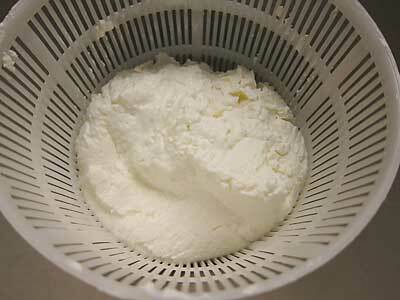 This recipe is for the cultured milk product Kefir. There is a lot of information available for the health conscious person on this fermented milk product, including Kefir water and Kefir tea. Here we talk about culturing milk to make Kefir. Although this fermented milk may be centuries old, it was not introduced to the western world, at large, until the late 19th century. Discovered in the Caucasus, due to the very long life expectancy, it seemed to provide well for those who drank it. One Gallon of milk is only mildly heated (86F) preserving these enzymes and bacteria. 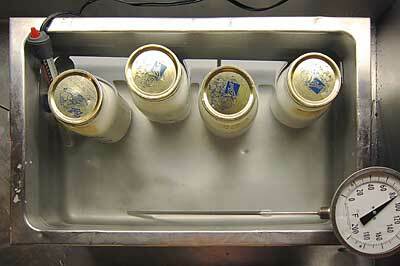 Some folks suggest doing this at room temp but we find that 86F is the optimum temp to start the cultures activity. It can then be allowed to cool to room temp as the milk ripens in the final step. Transfer the milk to a sanitized container then add 1 pack of our culture (C45 or C46 Kefir culture) and stir well into the warm milk. Note: if you have a fresh batch of Kefir already made up, you can add about 1-1.5 tablespoons of this per quart of milk. You can continue doing this for several generations until the Kefir begins to change in character. Our C46 Kefir is easier to do this with than the C45 Kefir culture. 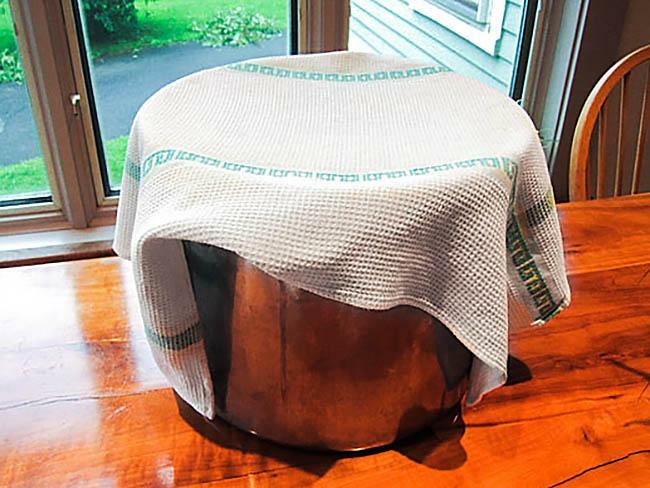 This is then covered allowed to ripen at room temperature (68-72F) for 8 to 18 hours or more depending on the character you would like in your Kefir. Longer time and warmer temps will make a more tangy tasting Kefir. With each batch you make, adjust the time until you get it just the way you like it. 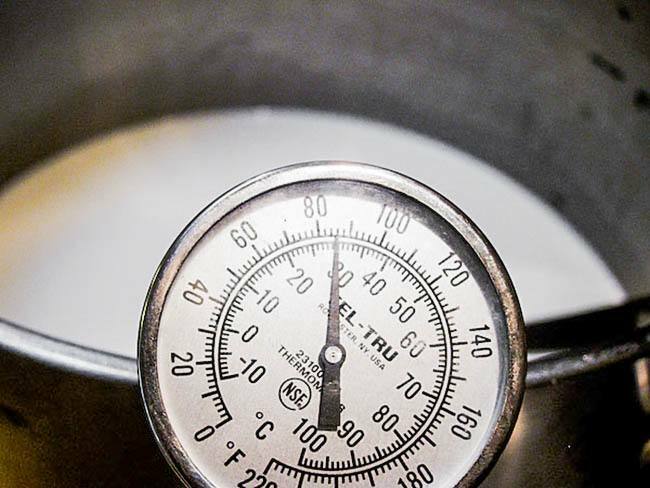 Time and temperature are the two control factors that determine the thickness and taste of your Kefir. In the warmer months Kefir may be ready to drink in 18 hours. If allowed too ripen too long at higher room temperature, it will become acidic, thick, and eventually the whey will begin to separate. 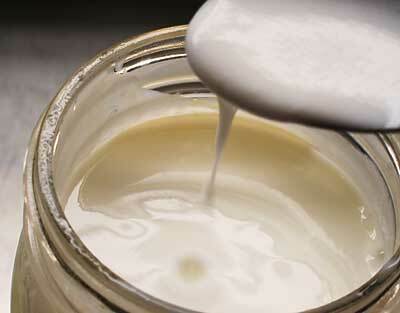 If your Kefir is "lumpy" and too sour, it has ripened too long or at too high a temperature. It should be creamy and perhaps a little thicker than milk. At this point, shake it well and place the Kefir into your refrigerator. It will thicken a little more since the culture will continue to do its work, but at a much slower pace. Here I have set up a ripening environment in a temp controlled (aquarium heater) water bath to observe the character of several ripening times and their final textures and flavors. I have used a pH meter to monitor the progress of the cultures along the way. The right hand photograph show 2 of the final products at 8 hrs and 48 hour ripening times. This creamy Kefir has been ripened for 8 hours. 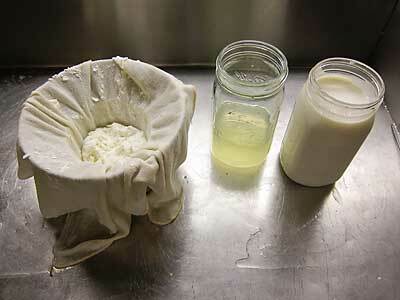 This is a Kefir ripened for 48 hours developing a definite curd which I have ladled into a draining cloth. After 6 hours of draining 1/3 of the Kefir volume has drained off as a very tangy whey. This whey can be used as a nice cool beverage or in cooking instead of water for soups, stews and more. The final Kefir can be more or less acidic as you might prefer it by simply increasing or decreasing the time you allow it to ripen. 8 hours will produce a mild acid flavor and a smooth milky consistency where a 12 hour or longer ripening period will produce a thicker and tangier flavor. In making test batches of Kefir here I have allowed the milk to ripen for different time periods ranging from 6 to 48 hours with the results shown below. 6 Hours | This is a mild fermented milk that flows just a bit thicker than unfermented milk but contains all of the good things in the Kefir (pH is greater than 5.3). 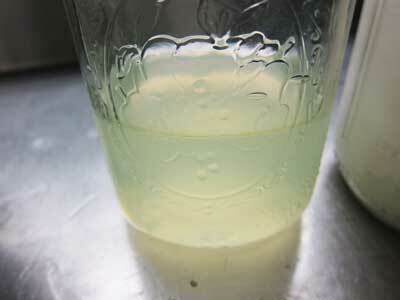 12 Hours | The milk develops a nice tang from the culture activity and has become much thicker (pH of 5.1 to 4.7). 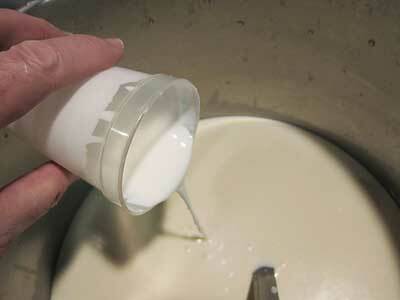 24 to 48 Hours | The milk becomes much thicker and forms a good soft curd. The flavor has a wonderfully refreshing acidity (pH is now as low as 4.3-4.5). This cheese follows in the path of Lebnah, a drained yogurt cheese. With the longer ripened, more acidic kefir above, the curd becomes firm enough to drain through a double layer of butter muslin. This will allow about 1/3 of the volume to drain off as whey and the curd now becomes a very thick curd which can be used with fruit similar to the greek styled drained yogurt. I like this drained Kefir better because of its more complex flavor. Another approach is to drain the Kefir to the point that the thick curds can be rolled into small balls and allowed to air dry a bit and form a dry rind (usually requiring air movement such as a small fan). When dry enough these can even be mixed with olive oil and herbs for a real treat. 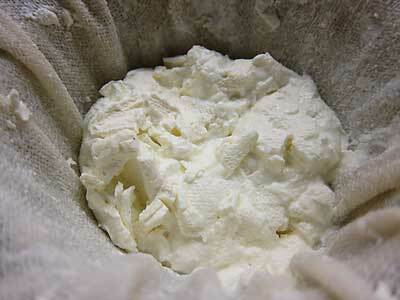 Everything may be fine except that you may need to let the milk culture longer to be a firmer texture (12 to 24 hours). Making Kefir is easier than making yogurt. 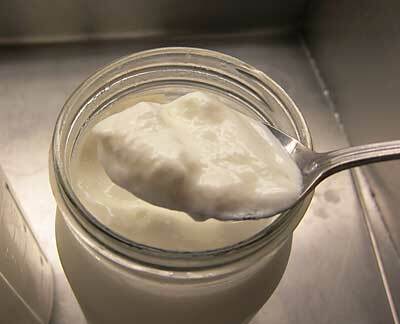 In traditional yogurt a step is needed to release the whey proteins, for a thick textured Yogurt, by increasing temperature to 185F and holding it there for 10 to 20 minutes. This step in not needed when makign Kefir. Kefir is not so familiar to folks in America but in many traditional cultures fermented milk products such as Kefir and Yogurt have been prepared at home for centuries. Culturing fresh milk into Kefir makes the nutritional factors in the milk, such as vitamins and minerals, extremely bio-available so your body can easily absorb and digest them. Kefir contains a complex culture of many healthy, hearty bacterial strains, passed down from family to family for centuries. Kefir can be made as a mild and thick textured milk for drinking or making into "Smoothies" or other delicious beverages as well as a more tangy thicker version that can be drained as a cheese wonderful treat similar to "Greek style" drained yogurt or even molded into a cheese and ripened further for several days or weeks. Some folks have even used the Kefir culture with rennet in making a Kefir cheese, which will use not only the lactose working bacteria but also the yeast and other Kefir components. So often we get comments from folks who would like to make yogurt from raw milk but do not want to increase the temperature high enough to alter the natural milk bacteria and enzymes. Kefir is the solution. Make Kefir from this milk instead of Yogurt. In making Kefir nothing really gets heated higher than the temperature of mama cow. This means that all of the bacteria and enzymes you have spent so much time to get in your raw milk will not be destroyed in the final Kefir product. In addition to lactic fermentation Kefir also undergoes alcoholic fermentation caused by the presence of yeast, which yields this sourish, yeasty, sparkling, refreshing end product. Also as mentioned above Yogurt production involves temperatures that destroy the natural enzymes and bacteria of raw milk whereas Kefir temperatures are low enough to preserve these. 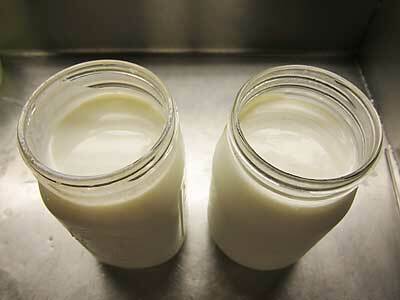 In making Kefir you have 2 options to consider for your first batch of Kefir. Traditionally people would save the granular bits that formed at the bottom of the Kefir jar to begin a new batch with fresh milk. Todays option is to use special culture powders that will always guarantee the same degree of activity. Since we are most interested in our customers having consistent results from batch to batch we have chosen to provide this "Direct Set". Our Direct set C45 or C46 Kefir culture can made at any time from the culture packs and yet can be re-cultured if desired for many generations. Our Kefir culture contains the following bacteria and yeast that will produce a wonderful consistent Kefir: l. cremoris, l. plantarum, s. lactis, s. cremoris, s. diacelilactis, saccharomyces kefir.